The most daunting aspect of learning to crochet? 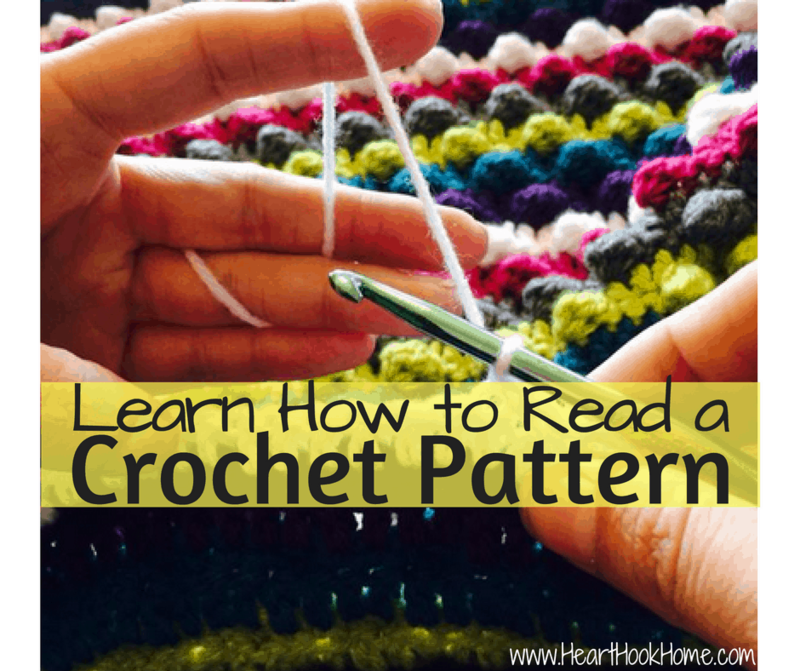 Learning how to read a crochet pattern. Seriously, they want me to ch-31, hdc in 2nd ch from hk, *sk 2 sts, hdc in next* to end? I promise that once you get the hang of discerning what the heck they are telling you, your enjoyment in crochet will only increase, as well as your stitch count. See what I did there? The more you understand, the less frustrated you get and the faster you can crank out those projects, the more rewarding crocheting is. For me at least. All the pretty things! Its so relaxing (and cheaper than therapy)! First, you’ll need to know your stitches. I have created a super duper fancy crochet term chart that you can save to your phone for easy reference. Not sure what that abbreviation is? Check the chart! I only use a handful of these regularly, but they are good to know and essential tool for becoming a master. *to save to your phone touch and hold the photo below. Note that these are in US terms. UK terms are slightly different, for example in UK terms you are told to “miss” a stitch instead of “skipping” a stitch as we do here in the US. 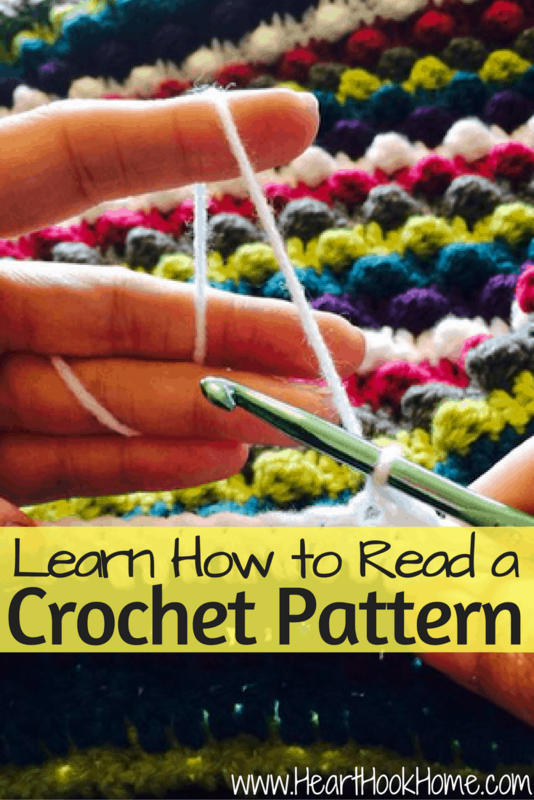 These terms are something to pay particular attention to when purchasing a crochet pattern or even before printing a free pattern. Crochet patterns will either be written in rows (for flat projects like this beginner level dish cloth) or rounds (for hats like this one or coasters, amigurumi etc). Many crochet patterns are rated on level of difficulty. 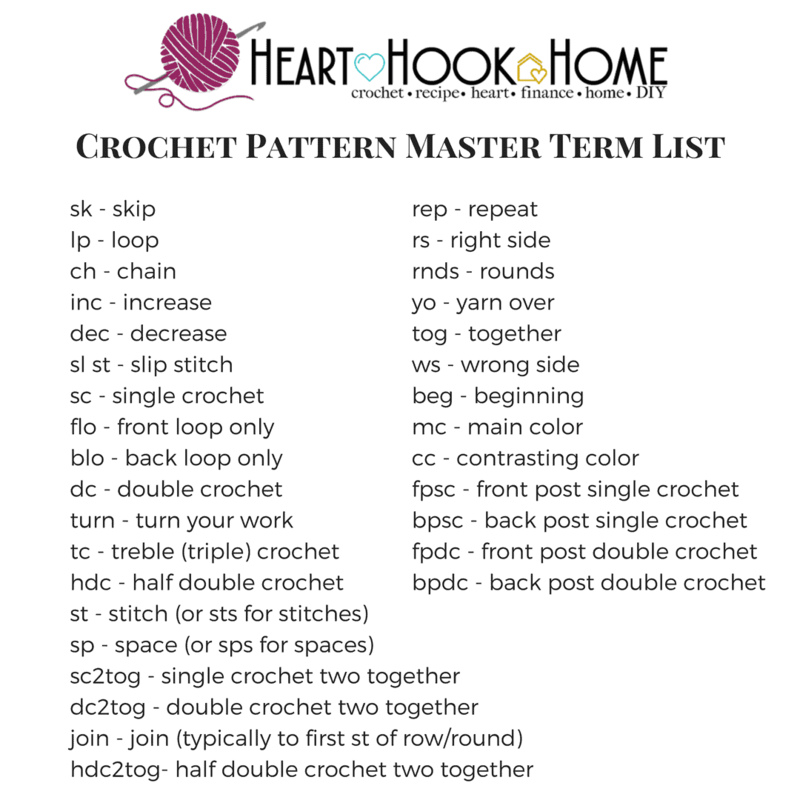 Most of the crochet patterns here on Heart Hook Home are beginner to intermediate, with only one (the Joker Amigurimi) begin difficult or advanced. 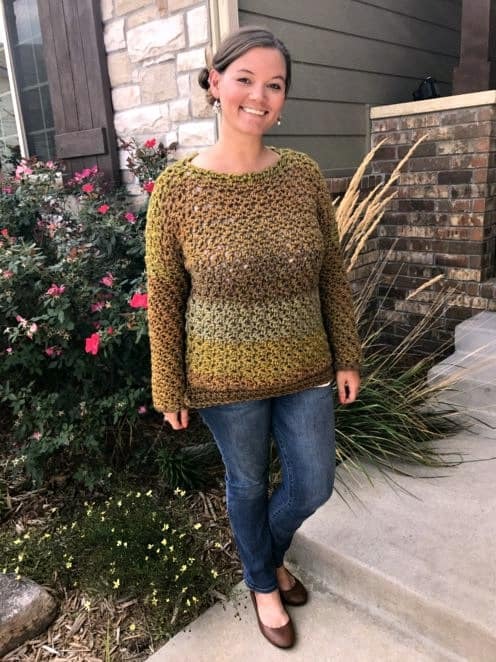 What to see our free patterns? We’ve got a bunch right over here. No matter what you’re crocheting or how large your project is, it is very important to count your stitches at the end of every row/round. Most patterns will tell you how many stitches you should have at the end of each round. If included they will be in the parenthesis at the end of the row. If you miss a stitch or accidentally do two in one stitch where there should have been only one, your project may start to look wonky. Crochet once and count twice, I always say. Remember that anything between two asterisks means that that particular portion will be repeated until they tell you to stop. Written in plain English this means that we will chain 10 chain stitches. We will then half double crochet in the second chain from the hook (not including the one ON the hook) and then half double crochet in each stitch until you reach the end. Then you’ll chain one stitch to start the next row and turn your work. Written in plain English this means that for row 1, we will chain until we have 16 chain stitches. We will make a half double crochet in the second chain from the hook (not including the one ON the hook) and in each chain to the end. Then we will chain one stitch to start the next row and turn our work. For rows 2 through 20, we will half double in the back loop only of each stitch across. When we reach the end we will chain one stitch and turn our work. Written in plain English this means that we will leave a long piece of yarn before starting our chains. When we do start chaining, we will do forty-one of them. Then, we will single crochet in the second chain from the hook (not including the one ON the hook) and single crochet in each chain stitch across. In row one, we are going to repeat everything inside the * * until we get to the end. So, we will single crochet in the first stitch, double crochet in the next. Single crochet in the next stitch, double crochet in the next. We will continue this single/double repeat alllll the way to the end of the row, where we will chain one and turn to start the next row. I hope this helps you to learn how to read a pattern. 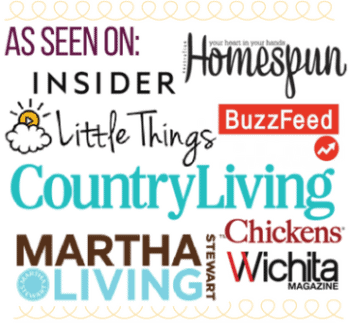 Please know that no matter what the pattern or where you found it, I’ll always be willing to help you figure it out (provided of course that you’re not sharing a paid pattern written by someone other than myself!) and I will always do my best to make you a better crocheter. Simply leave a comment or shoot me an email and I’d be happy to help. Did you also know that hook size and yarn size makes a huge difference in the way your item will turn out? Hi, I am working on a beanie pattern that is worked in rounds and would like clarification on the 8th round. It reads: (2dc in next dc, 1dc in each of next 17dc) 0 (4) times, 1dc in each of next 75 (3) dc, 1 hdc in each of next 2dc, 1sc in each of next 2dc, sl st in next dc-80 (84) sts. Clarification is needed on the 0, 4, and 3. Do I repeat what is in parentheses 0 or 4 times? What is the (3) for? Thanks so much. Bless your heart for making this a photo. So easy touch-hold and save image pops up! I can send it easily in an email or message. Thank you for the helpful information. The thing that I am having trouble understanding the the "graph" diagrams. Reading a pattern is the way I learned back in the day, like your chart of symbols. Now to see directions that look like commas, lines, etc. is beyond my understanding. Any suggestions for me? Thank you. Thank U for this web site , having trouble with this pattern - - Old World Fisherman pattern. can you help me?. Hey Ashley i was given some lion brand yarn and it 100% acrylic. I am not sure what to do with it every time I try to make something with it the yarn get attached to itself. Any suggestion. The yarn is beautiful it is called Boardwalk Promendade. Hey! I love and hate that yarn. ha! :( It's very hard to frog (rip out) and it does stick to itself. Try keeping your working yarn (from the skein) as far away from the rest of it as possible. That's all I got. But it is pretty!! Love your article . Love your Pic! For the most part everything is the same. I follow patterns pretty much exactly the only time I ever find something tricky is every once in a while a certain style of booties or when attaching a strap to a bootie I have to remember to go the opposite direction when counting out where to attach. But basically everything is the same. Thank you! I knew you'd know! Hi, I recently purchased your pattern for the Dragon tears fingerless gloves and I am stuck on row 4....please help. The directions indicate to " *2dc in center of next v-st" i have searched my crochet reference book and cannot figure out what a "v-st" is can you please clarify. Thanks! Hello! First, I love you work! You are so stinking talented! I recently purchased the messybun beanie pattern. I have attempted the adult size small a few times now but I am having a problem with it being really loose. Its almost like its just laying on my head & if the wind blew it would flop right off lol. Any tips on how to tighten and give it that snug feeling like when you put a hat on? Hey! Are you working with an H hook? You could go down to a G, and/or stop increasing at 60 sts instead. If you want to tighten up the one you have finished, you could reattach the yarn with a smaller hook and do a sc row or two around the brim. Keep me posted!